(National Sentinel) Expensive: Democrats regularly tout and defend unlimited immigration as an economic boon to the United States, but new findings by the U.S. Census Bureau prove what conservatives have often claimed: Most immigrants, illegal and otherwise, cost more than they are worth to the country. A majority of “non-citizens” — nearly two-thirds — including those in the country legally with green cards are hooked into various welfare programs that were designed to assist poor and ailing Americans. The finding by the Census Bureau is sure to provide additional political ammunition to POTUS Donald Trump and Republicans pushing to limit immigration, illegal and otherwise, into the country. “In a new analysis of the latest numbers, from 2014, 63 percent of non-citizens are using a welfare program, and it grows to 70 percent for those here 10 years or more, confirming another concern that once immigrants tap into welfare, they don’t get off it,” the Washington Examiner noted, citing a report from the Center for Immigration Studies, which used Census data. This also helps explain why migration to the U.S. is non-stop: No doubt they have been told by several American-based Left-wing groups that welfare programs are available to them for the taking. CIS noted that the figures support the president’s pledge to remove non-citizens from welfare rolls and the “public charge” if they want to obtain a green card so they can work legally in the U.S.
“The Trump administration has proposed new ‘public charge’ rules making it harder for prospective immigrants to qualify for lawful permanent residence — green cards — if they use or are likely to use U.S. welfare programs,” said CIS. 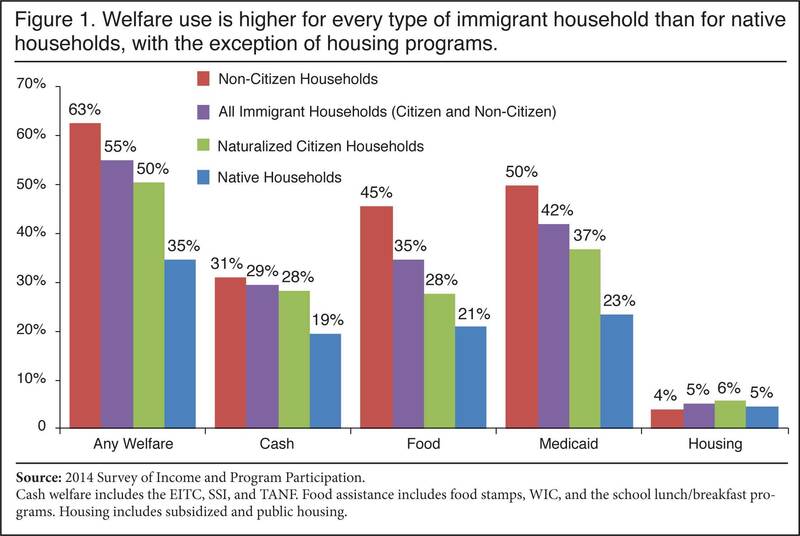 “Concern over immigrant welfare use is justified, as households headed by non-citizens use means-tested welfare at high rates. Non-citizens in the data include illegal immigrants, long-term temporary visitors like guest workers, and permanent residents who have not naturalized. “While barriers to welfare use exist for these groups, it has not prevented them from making extensive use of the welfare system, often receiving benefits on behalf of U.S.-born children,” the Washington-based immigration think tank continued. The numbers are nothing to dismiss: CIS said that there are 4,684,784 million non-citizen households currently receiving some form of welfare. And nearly all — 4,370,385 — have at least one worker in the house. 1) most legal immigrants have been in the country long enough to qualify; 2) the bar does not apply to all programs, nor does it always apply to non-citizen children; 3) some states provide welfare to new immigrants on their own; and, most importantly, 4) non-citizens (including illegal immigrants) can receive benefits on behalf of their U.S.-born children who are awarded U.S. citizenship and full welfare eligibility at birth. What is particularly galling about Left-wing Democrats and their limitless support for open borders is how they place illegal aliens ahead needy American citizens who these welfare programs were designed to help. by what constitutional authority are we forced to support foreign societal parasites? if anyone would like to point out precisely where that constitutional authority can be found within the constitution, i would love to see it! Census confirms: Nearly two-thirds of ‘non-citizen households’ on welfare. Well duhhhhh, is this really news ? AND they all vote DemonRAT, and therein lies the REAL danger.